Want to attract MBAs? Be more like Google, the new No. 1 on Fortune.com's list of 100 Top MBA Employers. (Fortune) -- Everybody wants to work for Google. After leaping into the No. 1 slot this year on Fortune's annual list of the 100 Best Companies to Work For, the company turns out to be tops with MBA students as well. For the first time on Fortune.com's list of 100 Top MBA Employers, more respondents say they'd rather work for Google than for traditional magnets McKinsey (ending its 11-year reign at No. 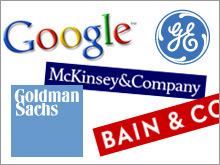 1), Goldman Sachs, and Bain & Co.
Another intriguing wrinkle in the 2007 survey results: Four of the five employers in the top 20 that moved up in rank this year - Nike (Charts, Fortune 500), Microsoft (Charts, Fortune 500), Apple (Charts, Fortune 500), and Google (Charts, Fortune 500) - are headquartered on the West Coast. (Bank of America (Charts, Fortune 500) is based in Charlotte, N.C.) Coincidence? Claudia Tattanelli, CEO of Universum, the research firm that conducted the survey of 5,451 MBAs on which Fortune.com's list is based, thinks not. "It's one sign of the entrance of the 'millennial' generation, born since 1980, into the mix of MBA candidates," she says. This demographic cohort, also known as Generation Y, "cares a lot about lifestyle. They're willing to work long hours, but when they leave work, they want to spend time outdoors in a great climate." For MBAs overall, New York City remains the favorite city to work in; but San Francisco has replaced Chicago (those brutal winters! those broiling summers!) as second choice, and San Diego jumped from tenth place to fifth. Granted, moving your company to the Left Coast probably isn't practical, but Tattanelli says that plenty of big, traditional MBA employers are looking at how they can be more like Google in other ways. For one thing, MBAs want to work in a culture where innovation is more than just a buzzword, she says: "Many students in the survey admire Google's practice of letting people spend 20% of their time working on new ideas. And Google is innovative, not just in its products, but in how it treats its employees." For investment banks and consulting firms where 70-hour weeks and grueling travel schedules are commonplace, meeting MBAs' growing demand for a life outside of work won't be easy. For now, these employers still make up fully half of the 20 most desirable but, predicts Tattanelli, "these firms will have to change the way they do business if they want to attract more millennials." At the same time, true to its reputation as a generation that values continuous hands-on learning, Gen Y helped boost "Leadership rotational programs" from 21st to 7th on MBAs' wishlist, cited by 17% of respondents. General Electric (Charts, Fortune 500) once again takes top honors in this area (outranking even Google), followed by Citigroup, PepsiCo, and Johnson & Johnson. One thing some old-school employers bent on wooing Gen Y have clearly already figured out: This is a generation raised on the Internet and other snazzy mass media, so if you want to wow them, create a truly great corporate website. Think the tech companies on our list enjoy a natural edge in this regard? Think again. Asked which employers' websites impressed them most, the MBAs surveyed gave top marks to McKinsey - ahead of Google, which came in second. Goldman Sachs, with the No. 3-ranked site, beat Microsoft (No. 4), and Citigroup (No. 5) edged out Apple. Of course, many newly minted MBAs have already had some inside experience at top employers by way of internships. For any company planning an internship program this summer, comments from students in this survey give a few clues to what really knocks their socks off. A recurring theme: real responsibility right away, as at Nike, where interns get control over products (with mentoring from higher-ups), or McKinsey and Boston Consulting Group, where MBA students are assigned to sink their teeth into client projects. Another popular feature of the highest-rated internships is lots of chances to rub elbows with top management. Microsoft doesn't have the highest-ranked internship program overall (that honor belongs to McKinsey), but for sheer star power, it's pretty hard to beat: Interns at the company's Redmond, Wash., headquarters are invited to an informal little get-together at Bill and Melinda's house. What do you think of the companies on this year's list? Should Google be No. 1, knocking McKinsey from its 11-year reign at the top? What should MBAs look for in an employer? How much should new MBAs be paid? And, have you worked for any of the companies on this year's list? Post your thoughts on the 100 Top MBA Employers blog.